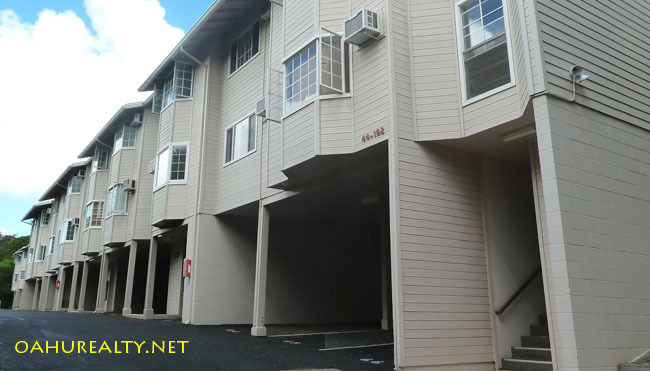 Healani Gardens is one of the younger townhome complexes in Kaneohe, constructed in 1990. There are 74 residences in nine two-story buildings. Properties are primarily two bedroom, two bath with 815 to 975 square feet of interior space. 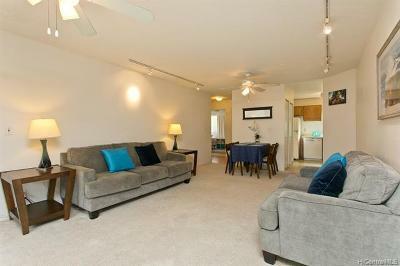 There are also twelve one bedroom units with 553 square feet of interior space. All units are single level - residents either live upstairs or downstairs. Amenities at Healani Gardens playground, barbecues, resident manager and plenty of guest parking. Pets are allowed. All units have two parking spaces. Healani Gardens is managed by Hawaiiana Management Company, phone (808) 593-9100. Take the H-3 freeway to Kaneohe and exit at the Mokapu Saddle Road. Proceed left on the Saddle Road and take a right at the bottom of the hill, onto Kaneohe Bay Drive. Shortly after turning onto Kaneohe Bay Drive, there are two roads on the right. The second right turn is Ikeanani Drive, that's where you want to go. Continue up Ikeanani Drive and Healani Gardens will be in view. Healani Gardens has a Facebook page here.